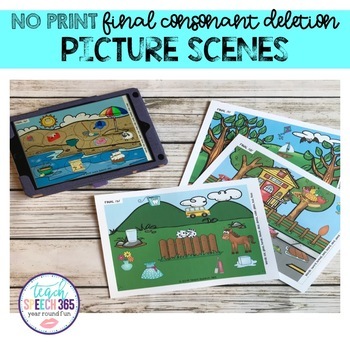 This no print articulation resource targets final consonant deletion and focuses on final /p, b, t, d, m, n, k, g, s, f/. Each scene contains 10 different items with the target sound. Word at the word, phrase, or sentence level! Some of the items in the scene are silly, which makes this perfect to use in mixed groups as well. Set Up: Download onto your iPad and open in iBooks. Alternatively, you can print and laminate the scenesand bind/attach with binder rings. -Expanding Utterances: I see the ______. -Prepositions: The cup is on the sand. -Find What’s Silly: Find the items in the picture that are silly and explain why they are silly.